Birmingham defender Martin Taylor has joined Norwich on loan to become new manager Glenn Roeder's first signing. The 27-year-old Taylor, who has played just one game for Birmingham this season, has moved to Carrow Road on a loan deal that runs until 8 December. Roeder said: "He's a player who I've followed throughout his career and he'll be an outstanding member of the team while he is with us. "He brings much-needed height," added Roeder on the Norwich website. 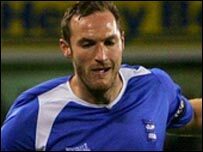 Taylor joined Birmingham from Blackburn in 2004 in a £1.25m deal. The defender could make his debut for bottom-of-the-table Norwich in Sunday's East Anglia derby against Ipswich.